Lipidic nanoparticulate self-assembled structures are effective carriers for drug delivery. 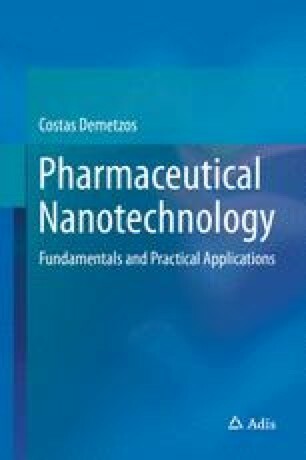 This chapter describes the most famous nanotechnological drug delivery systems that are already used in clinical practice and clinical evaluation or in academic research. Liposomes are nanocolloidal lyotropic liquid crystals that are able to deliver bioactive molecules. Their membrane biophysics and thermodynamic properties reflect to the creation of metastable phases that affect their functionality and physicochemical behavior. Thermo- and pH-responsive liposomes are innovative nanotechnological platforms for drug delivery and targeting. Polymeric micelles and polymersomes are nanostructures that are promising drug carriers, while dendrimeric structures are considered as real nanoparticulate systems that are used in drug delivery and as nonviral vectors as well as in prevention of serious infections leading to diseases. Vaccines based on nanoparticles such as liposomes are an emerging technology and liposomes seem to meet the requirement criteria of adjuvanicity. Liposomes can be prepared with various techniques that offer energy in order for the phospholipid bilayers to bend and form pseudo-spherical structures. The following liposome preparation protocols depend on the desired characteristics and size. This method (Fig. 4.15) is the most commonly used technique for multilamellar vesicles (MLVs). It is primarily based on lipid thin-film production that takes over the greatest possible surface in spherical flask in rotary evaporator under reduced pressure followed by hydration in a temperature greater than the main transition temperature of the phospholipids. The enclosed bioactive molecule to be incorporated or encapsulated is added either in the lipid film during its production if it is lipophilic or in the aqueous medium if hydrophilic . The thin-film hydration method leads to multilamellar vesicles characterized of great size heterogeneity (1–5 μm). These liposomes can undergo size reduction and transform into small unilamellar vesicles (SUV) or large unilamellar vesicles (LUV) with greater size uniformity. This can be achieved by using probe sonication or extrusion through specific porous polycarbonate filters. Both sonication and extrusion provide energy to the system (thermal, mechanical) that is required for breaking the MLVs’ liposome bilayers in small lipid vesicles, reducing the hydrophobic part exposure to the aqueous environment. Usually, before the use of polycarbonate filters, the liposomal MLVs’ mixture undergoes fusion to reduce their size. The freeze-thaw method includes the rapid change between cold and hot temperatures of dry ice or liquid nitrogen and the basic phospholipid transition temperature used in liposome structural units. These extreme conditions break the bilayers up and produce smaller multilayer lipidic vesicles. Phospholipid solvent injection in ethanol or diethyl ether in water medium is a technique for small or large unilamellar liposome (SUV, LUV) production. Phospholipids are primarily dissolved in a small volume of ethanol or diethyl ether and then quickly or slowly injected in water medium in a temperature greater than phospholipids’ transition temperature. The organic solvent is removed with evaporation, filtration, or dialysis. This method is simple and free from harmful (for the ingredients) chemical or physical processes, which is an important advantage of the method. Nevertheless, the disadvantages of this method include the extra stage of the organic solvent and solute removal and the production of liposome dispersion systems. Just like solvent injection method, phospholipids are dispersed in water environment through organic phase. The organic phase is not being removed but forms water in oil (w/o) emulsion. The phospholipid molecules are placed in unilamellars in a reverse micelle formation around the water molecules that during the organic solvent removal stage are agglomerated to form a mixture of unilamellar and multilamellar liposomes. Usually, a part of the water medium used for the liposome production is added into the solution of phospholipids in organic solvent. The rest is added after the organic phase removal. An advantage of this method is the great output in hydrophilic water molecules. This method for liposome and nanoliposome production has been developed without using toxic chemicals and hazardous processes. This method includes liposome structural component hydration followed by their heating in a temperature of 120 °C in the presence of glycerol . Glycerol is water soluble and physiologically acceptable from the human organism chemical molecule. It has the ability to increase lipid vesicle stability and doesn’t need to be removed from the final liposomal product. The heating process is the major stage, and therefore, the method is called heating method and the produced liposomes are called heating method vesicles (HMV). By thermal method application, there is no need to sterilize the utensils used; therefore, the time for this method is reduced and the liposome production costs are limited. HMVs can be used as bioactive molecule delivery systems and for biological membrane simulation. In comparison to conventional liposome production, during this method, no volatile organic solutions are used, only glycerol that is a biocompatible and nontoxic parameter already used in pharmaceutical products preserving osmolarity during liposome production. There are cases where structures that are produced with heating method resemble the cell membranes of organisms in primordial earth. This is another leading indicator that liposomes are critical parameters in life’s origin and determination. To form lipid bilayers and, therefore, liposomal vesicles (i.e., liposomes), no matter the preparation method used, the hydrophilic/hydrophobic interactions between lipids and lipid/water molecules are essential. The energy offered (sonication or heat) in the lipid system results in lipid molecule appropriate orientation through hydrophobic interactions and, therefore, lipid vesicle formation to achieve the necessary thermodynamic balance of the lipid system. Lasic, in his book entitled Liposomes: from Physics to applications in 1993 , suggested that symmetric membranes favored flat configuration and energy should be offered for lipid bending. The lipid type used and the presence/absence of cholesterol are parameters defining membrane rigidity. Whether pseudo-spherical lipid structures form liposomes in one or two stages (i.e., pseudo-spherical lipid vesicles), with specific thermodynamic content, as suggested by Lasic and coworkers, the basic condition for liposome formation is energy offered into the system. To summarize, liposomes are not formed spontaneously during lipid (mostly phospholipid) dispersion in aqueous medium, but extra energy input is required. In ‘heating method,’ for example, liposomes are formed due to energy offered into the system, and the mixing throughout the heating is performed to facilitate the homogenous ingredient distribution. During copolymer hydration, the motivation force for polymersome formation is the concentration gradient between copolymer diffused in water and water diffused into the copolymer. During simple hydration, the concentration degrades exponentially by time. The most common used method for polymersome formation is the thin-film hydration method. This method produces polymer emulsions with great size dispersion but also great amounts of other thermodynamically metastable polymersome structures. This method is based on organic solvents and is related to water-in-oil-in-water (W/O/W) double emulsions. This method produces polymersomes with asymmetric membrane, where the inside and outside surfaces are of different nature. This is achieved by stabilizing water in oil (W/O) emulsion using the copolymer for the inside lamellae and producing vesicles permeating the water droplets through a second oil in water interface that consisted of the copolymer in order to form the outer membrane lamellae. Polymersomes are finally formed with controlled organic phase water removal using dialysis through membranes. The disadvantage of this method is that the organic solvent residues can cause biologic toxicity, limiting the produced polymersome application and use. Many times during dendrimer production, scientists use, as cores bonds with special chemical and/or physicochemical properties, mostly photoactive or electroactive groups like porphyrins, ionic complexes, organ metal bonds, and fluorescent dies. The branches of dendrimers can be composed of repeated structural units. The number of the repeated structural units is controlled and defines the dendrimer generation (G). Each repeated structural unit is connected to the core or to another repeated structural unit through a branching spot. The branching spot between the core and the branch is of high importance since it determines the interaction between them. The branches play an important role in the dendrimer three-dimensional configurations and in the internal microenvironment. The dendrimer outer section ends up in peripheral groups. The part of these groups is also of great importance since they define the interaction between the dendrimer and each surroundings. 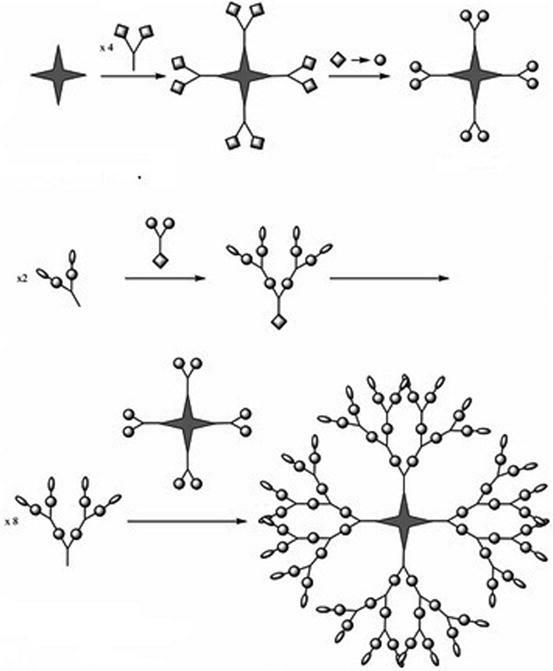 The number of the peripheral groups increases exponentially as the dendrimer generation increases. Dendrimer formation always includes a series of repeated reaction sequence whose completion provides each time a new generation. 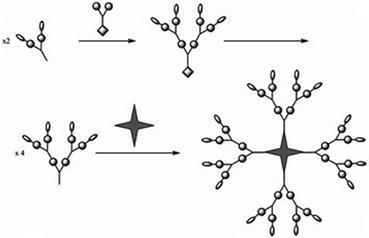 Dendrimers are composed of monomers through polymerization and this process includes two methods. The methods can be classified into two basic synthesis methods, the divergent method (Fig. 4.16) and the convergent method (Fig. 4.17), and there are processes that combine these two methods (Fig. 4.18). The divergent method seems to be more effective for large-scale dendrimer synthesis, since the dendrimer weight doubles or triples in each generation. By increasing the generation number, the active group number in the surroundings increases exponentially by the necessary use of large excess of reagents. These reagents have a big difference in their molecular weight with the product and therefore are easily separated from it during reaction treatment. The exponential surrounding groups increase in each generation, increasing the possibility of incomplete reaction or by-product production. In these cases, the by-product separation is usually extremely difficult since they have similar weight and structure with the dendrimer. The convergent reagent has more advantages in relation to the divergent method. Fewer reactions per molecule are needed during coupling and activation steps, and therefore, the use of large excess of reagents is not necessary – the cleaning is usually easier and the final product structure flaws are limited. Also, the precise surrounding group setting from the very first step allows the design of more target complex courses. In an effort of developing more efficient and less time-consuming complex courses for dendrimer synthesis, many complex courses combining the convergent and divergent method have been mentioned. This way the disadvantages of both methods will be limited by preserving their advantages. In 1991, Frechet’s group [32, 89] mentioned a double-stage convergent course (Fig. 4.18) in which the divergent method was used for large core formation (actually it was a low-generation dendrimer) followed by the convergent method for the coupling of the core and the branches that were formed separately. Another combining approach aiming in complex course development with few steps is the orthogonal coupling method (Fig. 4.19) which targets in activation step removal during branching formation. Liposomes are lipidic self-assembled nanostructures that are able to accommodate into their lipid bilayers or into their aqueous core, lipophilic and hydrophilic bioactive and biological molecules, respectively. Liposomes can be used as carriers for imagining and for diagnostic agents. Liposomes are characterized as nanocolloidal lyotropic liquid crystals, and their mesophases that taking place during their thermotropic behavior affect their functions and their effectiveness as drug nanocarriers. Liposomal membranes are studied based on their thermodynamics and biophysical aspects. Their thermotropic behavior affects their pharmaceutical effectiveness. They have been used to simulate biological membranes and to understand biological phenomena, i.e., the protein fusion in cell membranes. Thermo- and pH-responsive liposomal vehicles are emerged nanotechnological platforms for drug delivery and targeting. Polymersomes are composed of bilayers and their structural organization is close to that of liposomal bilayers. Dendrimers belong to the very last generation of polymeric structures. They are considered as real nanoparticulate systems with very low polydispersity profile. They are used in diagnosis, in drug delivery, and as nonviral vectors in gene therapy. Nano genomics is the term by which we describe as the nanobiotechnological applications. Vaccines based on nanoparticulate systems are an emerging technology. Liposomes are promoted as a type of adjuvants that can potentially satisfy the criteria of adjuvanicity.